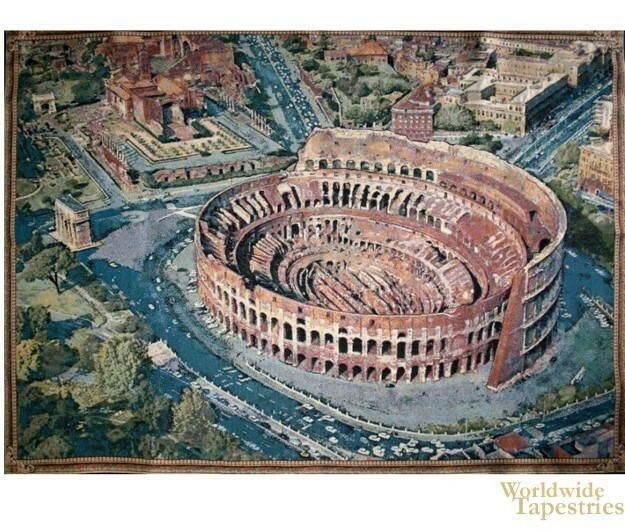 In The Coliseum Rome tapestry we see the Colosseum from a bird's eye view. Here we see the huge amphitheater originally built in 72 AD. The Colosseum can seat between 50 and 80 000 people and was the place of both battles and dramatic theatre. it is a spectacle of architecture and art. The Colosseum tapestry is backed with a lining and a tunnel for easy hanging. Note: tapestry rods and tassels, where pictured, are not included in the price. Dimensions: W 19" x H 12"
Dimensions: W 54" x H 38"